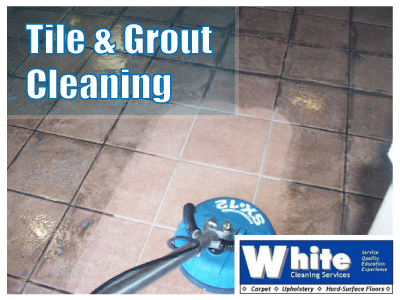 Tile & Grout Cleaning for Floors and Counters in Kitchens, Bathrooms, etc. Ceramic, Porcelain, Travertine, & more! Making Homeowners and Commercial Customers Happy Since 1995! You may not even realize it sometimes, but the grout between your tiles is porous and can take in the dirt over time. Even your tile itself with regular sweeping and mopping will slowly accumulate dirt that will take away the original luster of your tile. White Cleaning Services has the expertise and equipment to perform the type of tile and grout cleaning Normandy Park and Seattle area customers can be proud they chose. Our restorative tile and grout cleaning service can be used on kitchen and bathroom tile, and not just tile on the floor, but on countertops and other surfaces as well. Tile and Grout cleaning can be done with almost any type of tile, including ceramic, porcelain, travertine, limestone, and more! These services have become a larger portion of our business as folks and companies have realized the real benefit of pulling the deep dirt out of grout and tile. Many customers of ours add tile and grout cleaning to their regular carpet cleaning service in order to get all surfaces simultaneously clean and brilliant. Fill Out This Form To Contact White Cleaning Services Now! Check out our Winter Carpet Cleaning Special - get MORE for your money! Click Here to get your SPECIAL OFFER coupon NOW!